Welcome to your course support for Personality Theories. Part 1) Tool setup. Old learning did not leverage technology well. New learning does. New learning focuses on shaping your initial learning situation with our minds on how to use it, store it, and retrieve it. The first step is to set up your collection tools. The first is www.evernote.com. Sign up for a free account and begin creating folders for your different learning projects. The second tool is www.pearltrees.com. Sign up for a free account here as well. Use this to collect and organize hyperlinks to useful websites. Begin curating your own library and think about how the knowledge relates to projects. Part 2) Tool use. Start by creating a single note that is your running list of activities and the time/date you did them. This is basic note taking and for notes we have 3 basic formats. Your “Log file” is this list of date, time, activity that you just created. Topic or project files relate to specific areas of interest or work and they can be separate notes within “notebooks” or can all be all in a single note/list. Evernote is a good first place to take notes, but you can also sign up for a free online mind-mapping account at www.mindmeister.com/ Taking mapped notes puts ideas into an easy to view hierarchy and this software also lets you organize hyperlinks and files/documents plus collaborate with others. 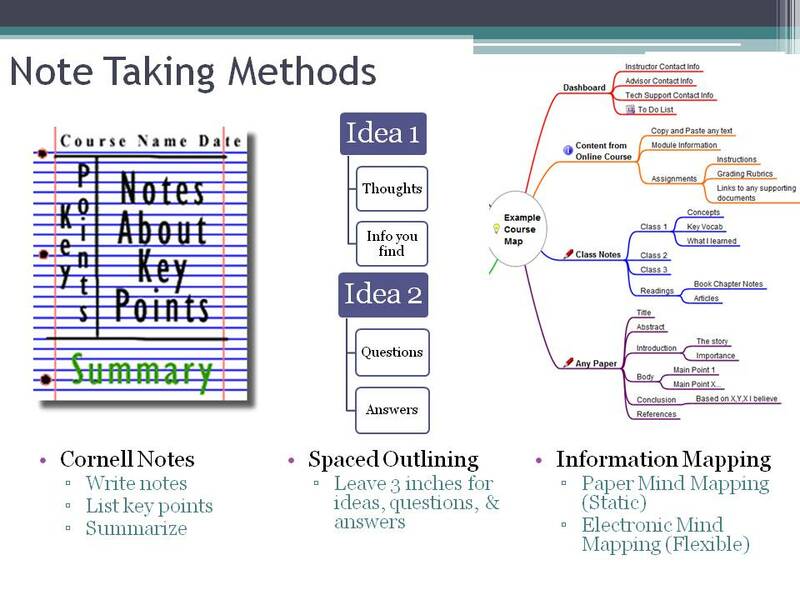 Use any of these tools for “Cornell Notes” or other methods (see image below). Part 3) Retrieval and re-investigating. Building on knowledge, or just getting it back. Dr. Sigmund Freud believes that the human mind has at least three parts. The conscious, pre-conscious, and unconscious. The unconscious is always with us, but has unclear influences on our thoughts and behavior. The conscious is what we can talk about and the pre-conscious is what might be able to be made conscious. If you are able to remain conscious during your learning but hate forgetting, then we use the electronic tools to make it MUCH EASIER to reboot your brain. We make it MUCH EASIER to load the contents of your pre-conscious mind into your conscious mind and then build on those ideas, or just use them in daily life. Protect your education by using, modifying, re-organizing your notes as well as writing short summary essays on what you are gaining from any class or knowledge source. Add these writings back into your notes or as stand-alone material. If you publish anything, even blogs, this is one way to collect your ideas and turn them into products. Start looking to see what is similar for all theories of mind and visit the class shared Google Docs spreadsheet.